The New Disappointment, by Lucy Ives Did You Get the L? Perfect-bound, 268 pp, 4.5" × 7.5"
Corrected Slogans represents a vital discourse on conceptual practices in contemporary art and poetry. The book is the fourth and final installment of the multi-part project Corrected Slogans (A Publication in Four Acts), which was conceived as Triple Canopy’s contribution to “Postscript: Writing after Conceptual Art,” an exhibition organized by the Museum of Contemporary Art Denver. As part of that project, Triple Canopy organized a series of public discussions, published a special online issue of the magazine, and affixed QR codes to the walls of the galleries at the MCA. Each “act” of Corrected Slogans—dispersed as they are between Triple Canopy’s home in Brooklyn, the exhibition in Denver, the Web, and print—is integral to the same dynamic process; the project as a whole represents Triple Canopy’s ongoing attempt to define an expanded field of publication. Corrected Slogans features annotated transcripts of public conversations between some of the most innovative artists and poets working today. The symposium “Poems for America” asked how conceptual strategies of writing have transformed conventional notions of expression. “Automatic Reading,” a seminar-style roundtable, focused on reading as a creative practice, and the book as a material object and social signifier. Additionally, the book includes new essays, artworks, and poetry by Nora Abrams, Andrea Andersson, Erica Baum, Franklin Bruno, Corina Copp, Michael Corris, Brian Droitcour, Jim Fletcher, Zachary German, Lucy Ives, Aaron Kunin, Margaret Lee, Paul Legault, K. Silem Mohammad, Ken Okiishi, R. H. Quaytman, Katie Raissian, Ariana Reines, William S. Smith, Mónica de la Torre, Gretchen Wagner, Hannah Whitaker, and Matvei Yankelevich. 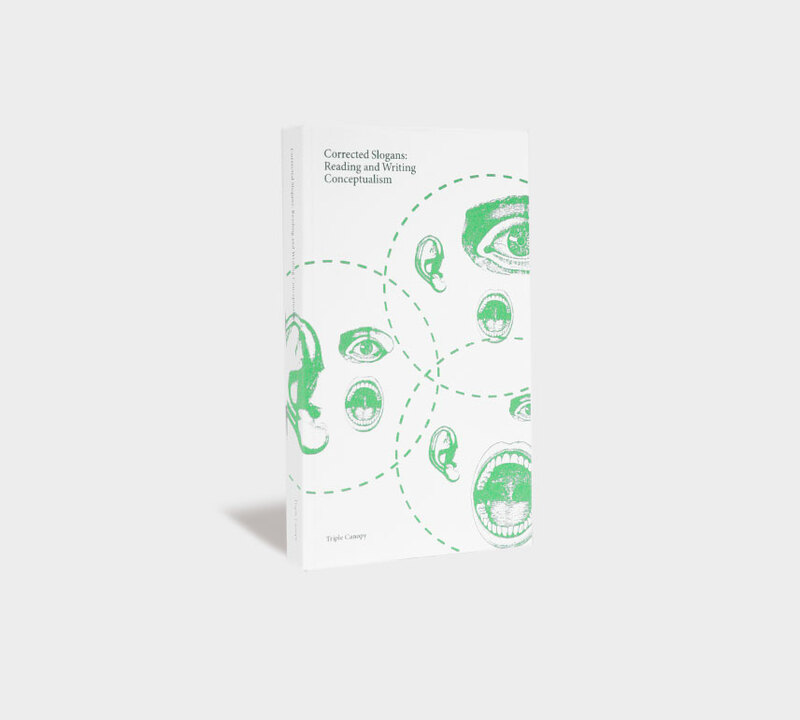 More than merely documenting discussions, Corrected Slogans activates the book as a site of creative production, enacting an expanded notion of publishing as a mode of critical inquiry. Distributed in North America by ARTBOOK | D.A.P. Major support for Corrected Slogans has been provided by the Museum of Contemporary Art Denver, the Orphiflamme Foundation, and Triple Canopy’s Publishers Circle.